Titan Quest, an action-RPG that is very similar to the Diablo series from Blizzard, just got a Nintendo Switch announcement. While the game was previously only available on PC, it eventually ended up on the PlayStation 4 and Xbox One. Now it’s heading to the Nintendo Switch on July 31st, 2018. So get ready to grab those spears, and raise those shields. From Age of Empires co-creator Brian Sullivan and Braveheart writer Randall Wallace comes an action role-playing game set in ancient Greece, Egypt, and Asia. The Titans have escaped their eternal prison, wreaking havoc upon the earth. The gods seek a hero who can turn the tide in an epic struggle that will determine the fate of both men and gods. I’m really curious about how well the online aspect of this will work on the system. Also, the video shows the Xbox control theme. I’m sure this will get ironed out before the actual release of the title. Not enough for ya? 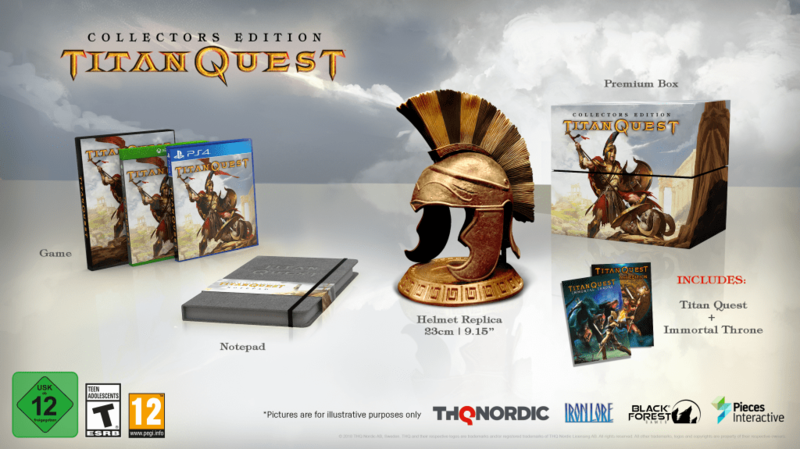 Ok, how about a collectors edition that comes complete with a Titan Quest themed notepad, a replica of a Greek war helmet (23cm/9,06 inches) all packed in a premium box. Sadly, the helmet can’t be worn. That is unless your head is actually that small. There’s also no word on the price of this just yet.